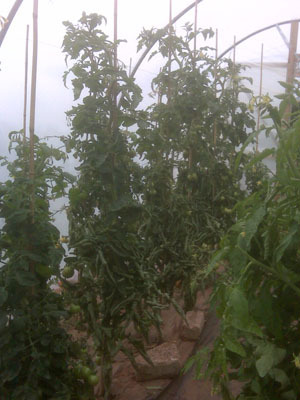 I grow tomatoes both outside and in the greenhouse. I like to grow different and unusual varieties that I have collected or been given, but I do have my favourites which are tops for flavour. 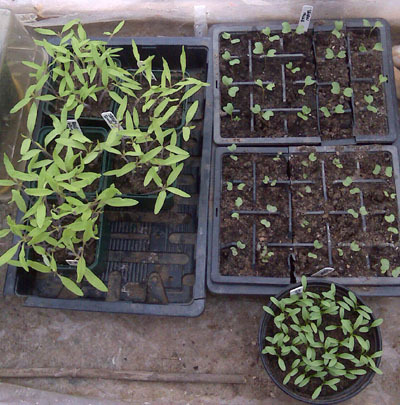 I start my indoor varieties by sowing a pinch of seed in a 75mm pot in my propagator set at 24 degrees. Fresh seed I have saved from the previous year will geminate within a few days, but older seed can take a couple of weeks to get started. Once the seedlings have produced their first pair of true leaves I pot them up in to individual 75mm pots and leave them for a few days in the propagator to establish their roots. 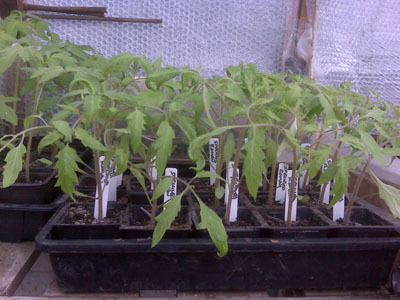 Then they go on to the greenhouse bench until they are ready to be transplanted into the their final position. 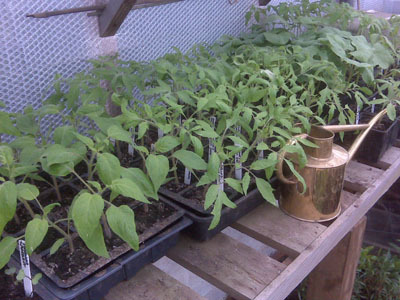 Outdoor varieties like the little Tumbler Tom which I grow in 25cm pots on the patio can be sown in early March so that they are ready to be hardened off and potted up into their final container by mid-May when all danger of frost has passed. 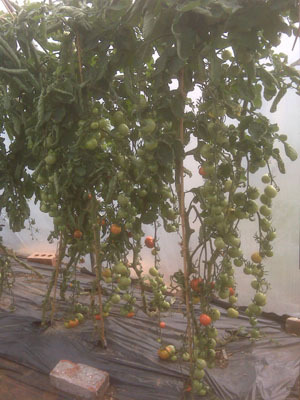 I like to grow my tomatoes up canes, spacing them at 60cm intervals. 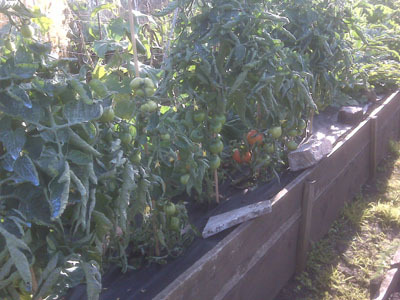 I do also plant tomatoes when I have the space in double rows 60cms apart. As the plants grow I tie them loosely to the canes for support. 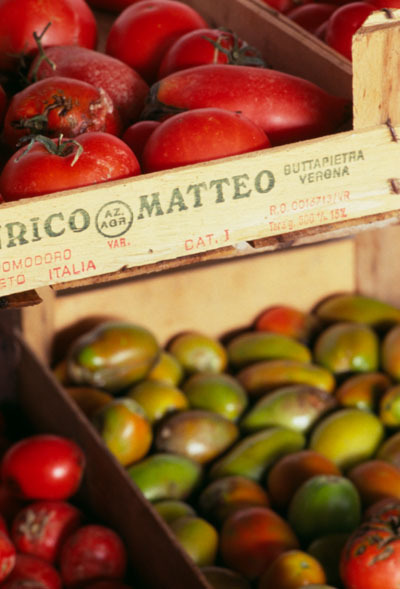 Tomatoes come in two types, indeterminate which means the growing tip just keeps on going and determinate which means the plant has a bushy habit. It is the indeterminate types that need to be grown up canes. Bush varieties look after themselves. As the plants grow up the canes they send out side shoots from the base of the leaves. These need to be pinched out. When the plant reaches the top of the greenhouse the growing tip should be pinched out to stop the plant growing any further. Tomatoes are greedy feeders. 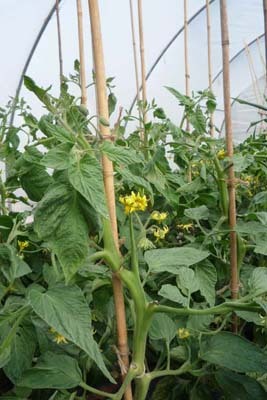 They need a proprietary feed regularly once the first flowers have set on the plants. They should be kept well watered at all times. 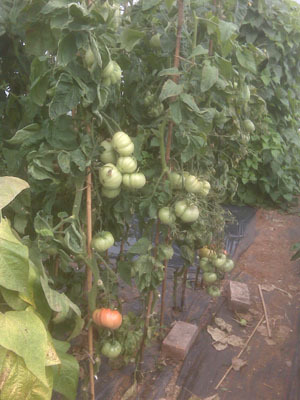 Because tomatoes are a member of the potato family they are prone to late summer blight. This can be a real problem on outdoor varieties in warm damp summers. A copper fungicide spray applied when any sign of disease – brown blotches appearing on fruits, leaves and stem – will help halt it. For organic growers like me a compromise is to use Bordeaux Mixture which is used by commercial growers of organic potatoes, otherwise the only defence is to put up a barrier of either glass or polythene or grow varieties outside that show resistance like the delicious Salt Spring Sunrise – available from me when I have spare seed or from the heritage Seed Library.